The fledgling Spanish season is two games old and it’s Las Palmas from the Canary Islands who sit just ahead of Barcelona and Real Madrid on goal difference all three teams with a 100% record. Valencia along with Celta Vigo and Athletic Bilbao prop up the table after losing their opening games; but perhaps the biggest surprise finds Atletico Madrid languishing down in 12th place after two draws and having scored only a single goal. 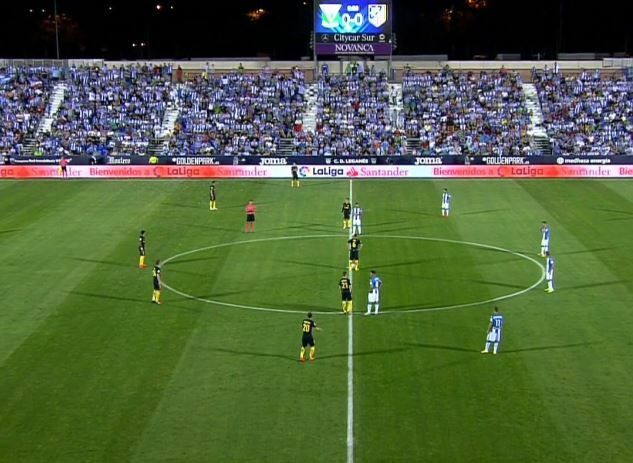 More of a surprise is that their opponents were promoted teams, Deportivo Alavés from the Basque Country who held Atleti to a 1-1 draw at the Vicente Calderón and tiny Leganes from the southern suburbs of Madrid, who held their much bigger neighbours to a goalless draw at the Butarque, their 12,000 seat stadium. 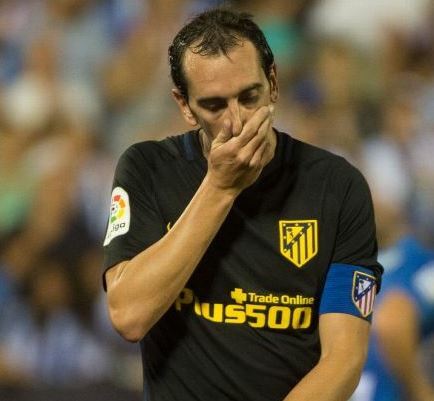 Atletico Madrid picked up maximum points in their opening two games of the 2013-14 and 2015-16 seasons and four points in the 2014-15 season, so their meagre return of two points is their worst start to any of the last four seasons. Atleti’s style of play has been notable for their low levels of possession, fewer attacks compared to their opponents; but highly threatening when they do attack. SportsMatrix examined the data for Atletico Madrid’s opening two games over the past four seasons to see if there has been any notable change in playing style. The parameters examined were attacking ratio, (i.e.) the percentage of Atletico’s attacks against those of their opponents; secondly the number of goal scoring chances reached per game and lastly the percentage of advanced attacks (i.e.) attacks in which Atleti and their opponents reached an advanced position as a percentage of all of attacks during the game. What stands out at the start of the new season is that for almost every attacking parameter Atletico Madrid have improved significantly, with the main exception being the number of goals scored. In season’s 2013-14 and 2014-15, their attacking ratio was lower than that of their opponents; last season they attacked marginally more than their opponents in their opening two games; but this season their attacking ratio is considerably more than that of their opponents. Atletico Madrid also successfully restricted their opponents to their lowest level (52%) of advanced attacks in any of the four seasons examined, whilst reaching their highest level (79%) in any of the previous seasons. 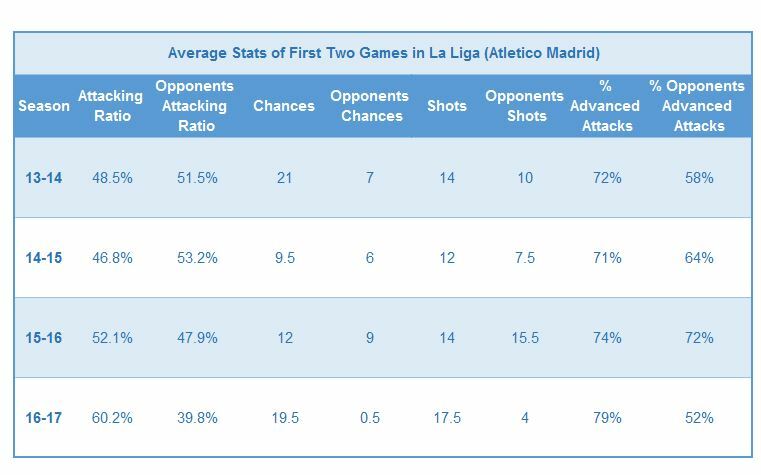 More notable has been in the shot department with Atletico averaging more shots per game this season (17.5) than in any of the three previous seasons, whilst at the same time restricting their opponents to an average of only four shots per game from these two games. Atleti have also averaged considerably more chances per game (19.5) than in the previous two seasons, although in season 2013-14 they average 21 chances per game in the opening two games, which included a 5-0 thrashing of Rayo Vallecano. But without doubt the most glaring statistic from the games against Alavés and Leganes is that Cholo Simeone’s team restricted their opponents to a single goal scoring chance and that only a half chance, compared to the previous seasons. So if Atletico Madrid have been so completely dominant in these two games, then why such a poor return both in terms of points and goals? Simeone’s team has always been the underdog, often relying on quick and direct attacks along with a solid and organized defence. These first two league games suggest that the smaller teams are now looking to adopt Atleti’s style and so far after two games it seems that manager Simeone is yet to find a solution to unlock a well-organized and packed defence.